(Nanowerk News) While smartphones can do incredible things these days, they’re still too expensive or complicated for some consumers, such as the elderly, disabled or technophobic. 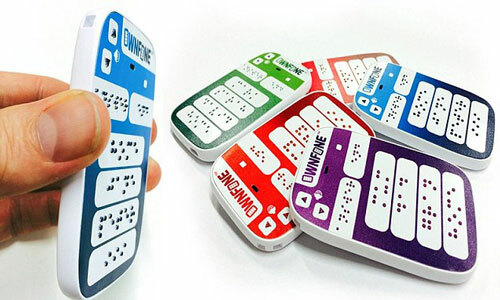 OwnFone, the makers of customised handsets, have launched the world's first 3D-printed customisable Braille phone for blind people. OwnFone was the first company in the world to introduce customisable phones partly created using 3D printers in 2012. Much like OwnFone’s standard model, the phone comes with a choice of two, four, eight or 12 buttons that can be assigned to pre-selected numbers. After choosing the Braille text to go onto each button, the company then 3D prints the case with raised buttons that blind users can simply feel to call the contact they need. For those who can’t read Braille, the buttons can instead be printed with raised text. The device enables those with blindness or partial vision to quickly phone their friends and relatives without having to deal with voice recognition or setting up accessibility options. Each Braille Phone comes in a color of the customer’s choice, so they know their phone looks good even if they can’t see it themselves. According to OwnFone inventor Tom Sunderland, the device is the world’s first Braille phone to hit the market, and the company’s 3D printing technique enables customization as well as low manufacturing costs. The handset on its own retails for £60 ($101) in the UK, while customising the color of the phone or adding pictures costs an additional £5. OwnFone also provides its own mobile network, OwnFone Service, offering subscription fees of between £7.50 and £15. OwnFone's service piggybacks on Vodafone's network, but text messages, roaming and data services are not available.